Life can be quite challenging and even more so when there are divorce or family law issues. 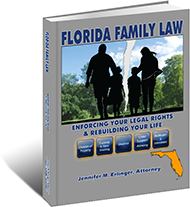 The book titled – Florida Family Law – Enforcing Your Legal Rights & Rebuilding Your Life is a helpful resource that covers a wide variety of family law topics and issues. In the State of Florida, the applicable law for a family law case can be found in the Florida Statutes, the Florida Administrative Code, and case law. Chapter 61, Florida Statutes covers divorce and post divorce matters. Chapter 742, Florida Statutes covers paternity matters. While there are specific laws, codes, and statutes in place for family law matters, the interpretation and application of these laws can be quite complicated. This book covers the topics and issues that commonly arise in a family law case in a practical and easy to understand manner. While the book is not a substitute for the legal advice, guidance, and representation of a Florida Family Law Attorney, the book does provide a road map of sorts so that a client, potential client, or other interested person can have a better understanding of the process and issues. The law firm of Wood, Atter & Wolf, P.A. has been serving the people of North Florida for since 1957. For the past 60 years, the Family Law Attorneys at Wood, Atter & Wolf, P.A. have represented its clients in a broad range of family law matters. Many of the family law case ultimately get resolved through an agreement or mediation. For some cases, a hearing or trial is required to enforce and protect the respective legal rights of a client. The book titled – Florida Family Law – Enforcing Your Legal Rights & Rebuilding Your Life – is provided for free by Wood, Atter & Wolf, P.A. Simply fill out the form below to request a copy of the book. All information is kept confidential. There is no obligation or commitment for those that receive the book. The attorneys and staff at Wood, Atter & Wolf, P.A. gladly share their knowledge with clients, potential clients, and others in the form of this book. To learn more about Wood, Atter & Wolf, P.A. and the services provided by this law firm ,visit the Official Website of Wood, Atter & Wolf, P.A. Since 1957, Wood, Atter & Wolf, P.A. has been On Your Side – At Your Side.